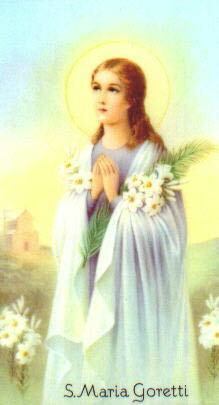 St. Maria Goretti was a young peasant girl born in Palliano Italy on October 16, 1890. Maria’s family can only be described as abjectly poor. Seeking to better themselves, Maria’s father, Luigi, went into a partnership of sorts with the Serenelli family. They moved their families to the small village of Ferriere, seven miles outside Nettuno working as sharecroppers for the local nobleman, Count Mazzoleni. The two families shared living quarters in the upper floor of an abandoned cheese factory located on the Count’s estate. Not long thereafter, Luigi contracted malaria and died leaving Maria’s mother to support their five children. Because her mother now had to replace her father in the fields, Maria assumed all the household duties and care of the younger children. On July 5, 1902, while Maria was doing some mending, the Serenelli’s teenaged son Alessandro, returned to their dwelling and attempted to force himself on her sexually. When she rejected him, he brutally stabbed her ten times, after which he went to take a nap leaving Maria for dead. He was awaked sometime later by Maria’s efforts to seek help, where upon he stabbed her four more times, which proved to be the fatal wounds. Maria’s whimpering awakened her baby sister who crying then awakened Alessandro’s father who was napping on the first floor. He sent for help. Nearly four hours later Maria was transported to Nettuno by horse-drawn ambulance over rough country roads where doctors tried in vain to repair her wounds. Despite the brutality of the attack and her subsequent suffering, Maria consented to forgive Alessandro stating that she wanted to do so for the love of Jesus and so that Alessandro could be with her in heaven. She survived until the next day, dying on July 6, 1902, approximately three months short of her twelfth birthday. Alessandro was captured, convicted of his crime and sentenced to 30 years in prison, the first three of which were in solitary confinement. While in solitary, Maria visited him in a dream offering him fourteen lilies (symbol of chastity), one for each wound, as she assured him of her forgiveness. As a result, Alessandro experienced a deep conversion, and upon his release from prison sought out Maria’s mother to beg her forgiveness. Stating that Maria and Christ had forgiven, she said she could do no less. As Maria’s story became known, it captured the hearts of the Italian people and devotion to her quickly grew with several miracles attributed to her. During her canonization investigation, Alessandro, as well as Maria’s family and neighbors, was one of the witnesses who testified regarding her sanctity. On June 24th, 1950, St. Maria Goretti was canonized by Pope Pius XII, with her mother and siblings present (this was the only time a parent was ever to witness a child’s canonization). The ceremony had to be held outdoors in St. Peter’s Square in order to accommodate an unprecedented crowd in attendance, which numbered over one-half million people. St. Maria’s feast day is observed on July 6th.